"the Blight has got me beat all because Jack Jenkins never put the Argerol in the medicine chest as I requested". C.A.G.E File. N.A.A. Series A431. Control 1948/1143. B/C 68988. page 195. No doubt Lasseter was referring to the popular patent medicine, 'Argyrol', a dilute silver nitrate solution, and in Lasseter's era a specific treatment for trachoma or sandy blight. According to his diary and the letters found on his body, Lasseter was plagued by sandy blight after his camels bolted in the Petermanns. He makes two references to Jack Jenkins and his culpability in omitting the Argyrol from the medicine chest, the first in the 'Dear Rene' letter found on his body by Bob Buck and the complete text of the letter reads as follows. Part of the original letter appears opposite page 238 of Lasseter's Last Ride, and the reader will note the reproduction ends at "the Blight", and in his transcript of the letter, Idriess has omitted the second paragraph with reference to Jenkins and the Argerol. 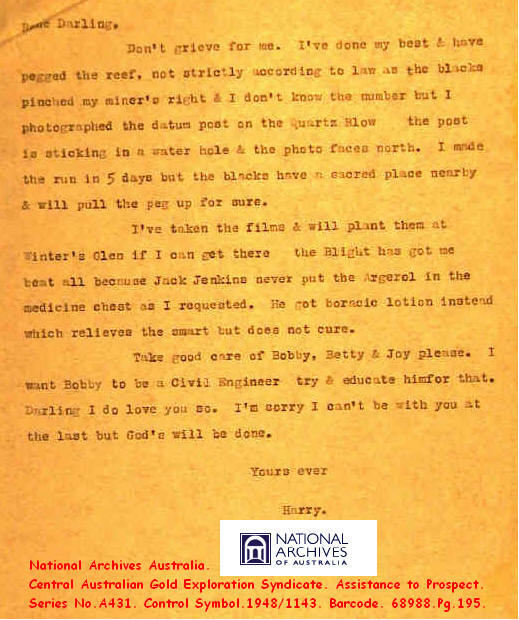 As mentioned elsewhere, perhaps Idriess edited the letter with an eye to continuing good relations with John Bailey and Jack Jenkins, both senior officials in the Australian Workers Union. Idriess has used some licence in stating that the page was part of Lasseter's Diary. Lasseter makes a second disparaging reference to Jenkins and Blakeley at page 28 of his diary, "I leave my everlasting curse on Blakeley & Jenkins. Blakeley for not sending the relief as promised and Jenkins for omitting the Argerol". And at page 69 writes, "I find it hard to forgive Jack Jenkins for his wilful neglect" in not including a couple of ounces of Argyrol in the medicine chest. Lasseter's Diary. 28,69. Lasseter's Last Ride. Idriess, Ion. L. 238,239. National Archives Australia. C.A.G.E.File. Series A431. Control 1948/1143. Barcode 68988. pg 195.